What do fatigue, a weakened immune system and impaired brain activity have in common? It turns out they’re all symptoms of iron deficiency. An astonishing number (35 to 58 percent), of young, healthy females experience low iron levels at one time or another and the number goes slightly higher during pregnancy. By the time a woman is diagnosed with anaemia, her iron levels can be in the red zone. So what does a low iron count mean? It’s actually a sign the body isn’t making enough healthy red blood cells to deliver oxygen from the lungs to the body’s tissues. About 70 percent of the body’s iron floats around in the blood in the form of hemoglobin, a protein in red blood cells that carries and delivers oxygen to the body’s tissues in order for it to stay alive. Myoglobin, a protein in the heart and skeletal muscles, also requires iron to function efficiently. Iron is an oxygen carrier and also a catalyst for enzymatic reactions that help the body with energy production, metabolism and DNA construction. Bumping up iron stores is easy: simply take a daily iron supplement. But not all iron supplements provide a pass from uncomfortable side effects like constipation, diarrhoea, stomach upset and nausea. CanPrev’s Iron Bis-Glycinate 25 does. It contains the preferred bisglycinate form, a chelated iron that is easy to absorb, gentle on the stomach and doesn’t cause gastrointestinal upset. No need to give up on iron supplements because they can’t be tolerated. 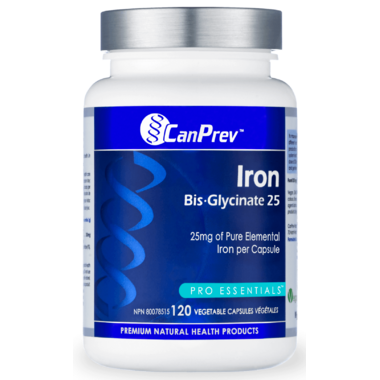 CanPrev’s Iron Bis-Glycinate 25 boosts iron and lets the body stay upset free. Adults - Take one (1) capsule per day with food, or as directed by a healthcare practitioner. Take a few hours before or after taking other medications. No stomach problems, no intestinal problems, no after-taste like some supplements. Great product in those ways. His product does the trick. No stomach or intestinal upsets. Will buy again!